If it was muslims or someone else who burned it down. It doesn't matter, the real loss is that it is impossible to rebuild. No architect exists who wants or knows how to build the beautiful or the sublime, they only know marxist brutalism. No stone masons, glass workers, sculptors exist, they've all been replaced with chinese steel and glass. No spiritual rulers who understand the need for the divine and everlasting. No artists to paint the portrait and paintings, they only paint ugly degenerate images. Tell me about the superiority of modernity, once the rebuilding efforts fail. (04-15-2019 03:36 PM)Syberpunk Wrote: I was watching Euronews (spits) and they had a young architect skype calling from the street saying that if it is rebuilt and France (its people) has changed and can never be rebuilt the same way, never will feel the same. I couldn't figure out if he was happy or sad or didn't care. Prepping the people for a triangle monstrosity in its place? I suppose the thing to do is keep the now ruins of Notre Dame, stabilized to the point they can be. Run a "Never Forget" campaign. So in one month, the 3 most-famous cathedrals, churches or basilicas of France have been (partially) destroyed. First, Saint-Sulpice, read below. Then, an illegal Pakistani migrant partially destroyed, in March, the inside of the Basilica of the Kings of France (in Saint-Denis). Three days ago, this illegal migrant was discreetly judged, and jailed. Now I wonder, is all this part of a global Jihadist offensive? Or just coincidences? The burning of Notre Dame could also be related to yesterday's controversy , when a teen Native French, called... Hugo (like the writer of Notre Dame de Paris) had "jokingly" disrespected the Mecca building of Islam, thus unleashing a huge backlash and threats of retaliation from the local islamists. Yes old buildings can catch fire quite easily and many, if not all of them have poor fire prevention. Hundreds of years of oil and other chemicals put into the wood on top of other materials makes it a very deadly combination under the right conditions. The design of a Cathedral would allow a fire to build quite quickly as the stone blocks would act as an oven with the windows acting as air gaps. However also bear in mind France has a serious Islamic terrorist problem and the authorities love to down play it I will keep my mind open as to the cause. Those who choose to ignore this by insulting others and crying conspiracy theories haven't been paying that much attention in recent years. The fire fighters were busy getting precious art and other treasures out of the building. A fire of that magnitude requires specialist equipment and not everywhere in paris would have it. 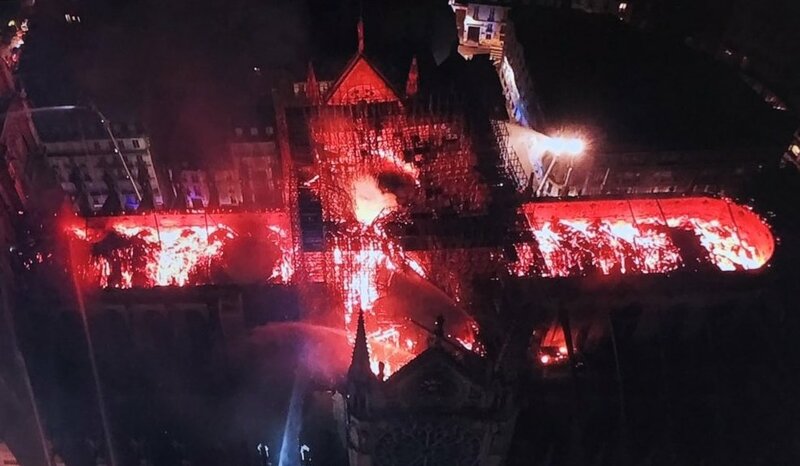 (04-15-2019 04:19 PM)Going strong Wrote: So in one month, the 3 most-famous cathedrals, churches or basilicas of France have been (partially) destroyed. "Once is happenstance. Twice is coincidence. The third time it’s enemy action. " (04-15-2019 04:15 PM)nomadbrah Wrote: If it was muslims or someone else who burned it down. I agree with this that rebuilding Notre Dame is going to be damn near impossible. The craft skill-set is nearly extinct, if not already. Fortunately, it appears that they did save the basic structure (the two front towers are intact as are the great bells). So maybe there is a chance after all. It would be a travesty on a tragedy to rebuild with some kind of brutalist architecture. I despise brutalism and especially despise Le Corbusier, who was the originator of it. video of french people singing in the streets. Heartbreaking. Of course they fought to save the front towers: under their "new plan" they won't have to build a minaret from zero. The damage is too extensive. A country in decline cannot simply "rebuild" their most sacred landmark. And if they try, it would take a decade or more. Consider that it took 13 years for the World Trade Center to be replaced, and that was a standard skyscraper. I'm catholic and I feel ready for war honestly. Atfirst I thought this was just blood lust sparked from alot of anger build up from these last couple of weeks (betrayal, family member's death, The closing of my own church that I grew up in plus the closing of the combined high school I attended)But as soon as I saw the actual video of the church falling and the haunting voice of the news reporter I felt the same feeling (only less dramatic) as I felt when my grandfather died. I just get a strong feeling that this is leading u to something huge. Muslim migrants throughout Western Europe will still continue to vandalize and destroy any and all churches. Government isn't doing anything about it. When will people ever take the stand and fight back? Quote: Christianity Under Attack In Europe—Few Care. Similar reports are coming out of Germany. Also, let's not forget Christian persecutions and genocide are happening in some parts of the world as well. (04-15-2019 04:42 PM)Roosh Wrote: The damage is too extensive. A country in decline cannot simply "rebuild" their most sacred landmark. And if they try, it would take a decade or more. From looking at that picture, it is like looking at a cross. Edit. Might as well say The Lord's Prayer. The Gatestone Institute is a zionist propaganda outlet, they are pushing their narrative while people are angry and highly susceptible to psychological manipulation. Quote: In Nimes (department of the Gard), near the border with Spain, the church of Notre-Dame des Enfants was desecrated in a particularly odious way, with vandals painting a cross with human excrement, looting the main altar and the tabernacle, and stealing the consecrated hosts, which were discovered later among piles of garbage. Feces, obscene gestures - those are the hallmarks of satanists -. Best to wait and see until the forensic details emerge. They aren't going to release objective forensics details. I was already going to join the military but this has fueled the idea even more. TRAINING for what is to come. I really have a hard time believing it was just a renovation accident. If the risk of fire was that great for a priceless building then they'd have fire-prevention equipment. This concrete monstrosity, the Sagrada Familia, began construction in 1882 and its still not finished. They're not rebuilding Notre Dame in a hurry. Cathedrals and churches are often built in the shape of crosses. They now say the structure will be saved. If it takes ten years or more to rebuild, that's an opportunity. The medieval cathedrals took hundreds of years to build. The building process itself was a way to show public reverence. Mobilize people and let them participate in different ways. Even in modern times, construction of Sagrada Familia in Barcelona is taking 140 years, and the process of building itself is an attraction. It could be the same way with Notre Dame. This is an opportunity to revive reverence for God along with crafts like stained glass. Yes, it won't be the same, but the process or rebuilding is a kind of worship. The knowledge and skills still exist in Eastern Europe. They'll have to bring in lots of artists and craftsmen from Poland and Russia if they want to have a decent chance of faithfully rebuilding it. The muzzies aren't too sad over this. (04-15-2019 05:00 PM)LEMONed IScream Wrote: I was already going to join the military but this has fueled the idea even more. TRAINING for what is to come. So, today is exactly one month after the Christchurch mosque events. But I'm sure that's just coincidental. That must be why no one is mentioning it. WTF is going on here!?! This is the start, or continuation, of something quite dire, I'm afraid. There are actually a lot of skilled craftsmen in France constantly working on restoring monuments. There is some art that might not be replicated to the same level, like for example the stained glass, which medieval craftsmen have perfected over generations, but I am sure that Notre Dame will be rebuilt to high standards. Notre Dame is a much older cathedral than the baroque Frauenkirche, but the scale of the work is similar.